If you are wondering why we are showing you these windows when you can see them in the flesh any Sunday, then you obviously donâ€™t live in the U.S.A., or Australia, or Little Puddlington on Sea. Even if you go to church in Dunhill seven days a week, you may never have taken the time to look closely at the windows and so you may see them here for the very first time. Even if you have studied the windows, it is difficult to appreciate their beauty from the floor of the church or by climbing up onto the window ledges â€“ we know!! The various window images can be accessed from the menu on the left. They can all be enlarged by clicking on the images and it is then that their true beauty unfolds. Because of the sloping nature of the site, the church was built with a reversed orientation so that the main door of the church faces east rather than west. The order in which the windows occur in the menu is as follows: We begin with the main window in the west gable, above the altar, and then turn left through the south transept, the south wall of the nave, the north wall of the nave, the north transept and, finally, the east gable window above the main door. Before you embark on your journey through the stained-glass windows of Dunhill church, take a look at the window below. It is by the famous Harry Clarke (1889 to 1931) who was undoubtedly Ireland’s greatest stained glass artist. 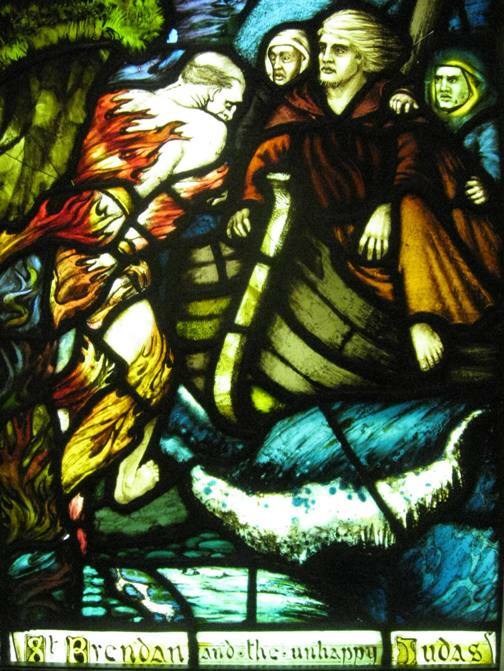 It depicts St. Brendan meeting Judas. Unfortunately, we do not know who made Dunhill church’s windows, but we know it wasn’t Harry Clarke. Click the image to zoom in.